What isn't funny about a squirrel on amp, playing a banjo? Nothin'. Especially when you find out you can buy it for all the men, women, and kids you know. You can buy this shirt here. Well, if you're skeptical, too, then you should know the whole story. The squirrel pictured above (Chuck -- that's his name) was a squirrel who played the guitar. Electric guitar. And then one day, he visited his country squirrel folk and became amazed by the wonders of country music. Especially the ways of the banjo-pickin' rodents. When he came back to the city, he was a changed squirrel. He selected one of the finest banjos the countryside had to offer, and began a new career as a banjo-playing squirrel in the big city. But, unable to completely abandon his musical roots, he created a new fusion style that involved banjo amplification. 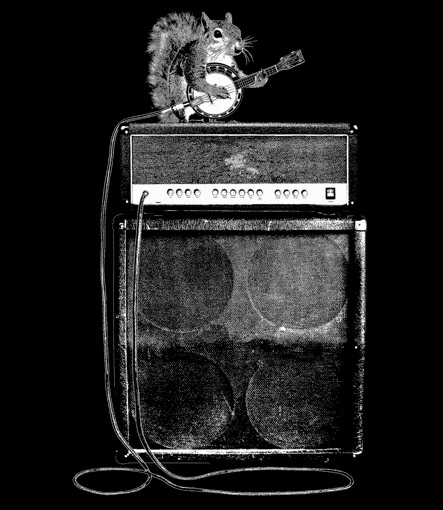 Now this funny squirrel-on-amp gig rules the world. Long live Chuck, the squirrel with the banjo.